CHEMINÉE LINING.E inc. venting systems models GDP, GDPL, GPDL2F and GDPL4F are listed by Underwriters Laboratories, inc. (UL) under File MH26661 and tested in accordance with UL 1978 Standard for grease ducts. 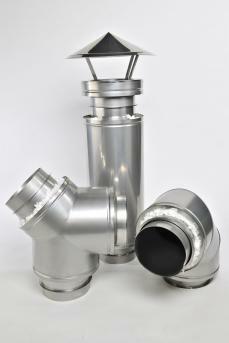 These requirements cover grease ducts and grease duct assemblies that are intended to be installed with less than or greater than 18" clearance as specified in the Standard for Removal of Smoke and Grease-Laden Vapors from Commercial Cooking Equipment, NFPA 96 or the individual listing intended for installations where the duct passes through partitions or walls of combustible material or where the duct is located in proximity to combustible building construction. Installation of GDP, GDPL,GDPL2F and GDPL4F grease ducts is made in accordance with CHEMINÉE LINING. E inc. installation instructions manual and NFPA 96 "Standard for Ventilation Control and Fire Protection of Commercial Cooking Operations". GDP, GDPL,GDPL2F and GDPL4F grease ducts are suitable for continuous operation at temperatures not exceeding 500°F (260°C).